Protection against piracy is a proposition which has been around for a long time in the software development arena and is very familiar to most software vendors. But, what about document licensing and protection? How can revenues be guaranteed or even multiplied from sale and accurate management of documents? Does this topic need to be dealt with differently because the finer details are more complex than with standard software? 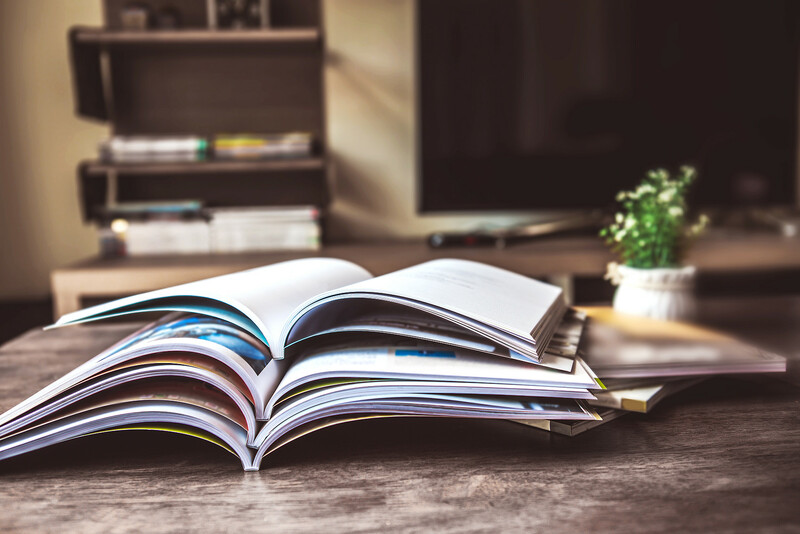 The article explains similarities of the two scenarios and peculiarities of secure document handling from a business oriented point of view. The exchange of information is a fundamental part of our communication culture. Nevertheless, it shouldn‘t always be possible to duplicate information or grant free access to it. 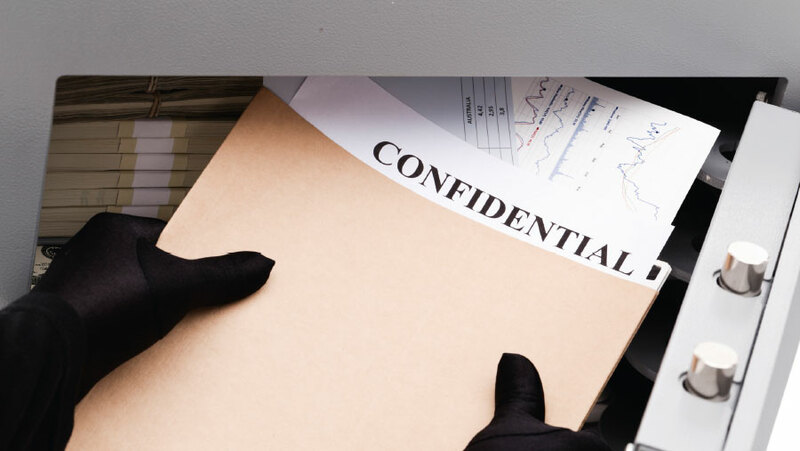 Know-how within a company should be protected, with access only granted to particular groups of people such as service technicians in order to hinder industrial espionage. In this day and age of globally networked systems, managers need to think about digital documents in a completely new dimension and implement the necessary measures to protect them. In line with the motto “One Technology fits All”, with CodeMeter Wibu-Systems offers a comprehensive solution which does not only fulfill the requirements of document files, but also those of traditional PC market, industrial devices and cloud-based infrastructures. Back in the early nineties the software company Adobe® introduced PDF, an exchange format for digital content. Today this format is recognized as an international standard. The functional scope of Adobe® Acrobat® includes a document protection system based on password assignment. However, there are two fundamental problems with passwords; first there‘s no way to prevent them from being passed on, and secondly, they are often far too short and obvious which makes them easy to crack. The basic idea behind passwords is in principle correct but in practice the security they offer is usually worse than bad, to say the least. Long and cryptic passwords are not the solution either as they are not practical for everyday use. A better solution would be to generate passwords automatically and store them immediately in a secure hardware dongle or software license. Wibu-Systems‘ approach to the solution makes use of Adobe Acrobat‘s encryption technology. Following installation, SmartShelter PDF® nests itself into the program as a plugin and provides the user with various functions for generating protected documents. The plugin is available for both Windows and Apple Macintosh. A globally unique Firm Code generated directly for the user by Wibu-Systems and an arbitrary Product Code form the backbone of the security concept. Combined together, the result is a use license for the document which can be stored in either a hardware dongle (CmDongle) or a soft license (CmActLicense). Before the document can be encrypted, the SmartShelter PDF plugin must be started. The publisher of the document enters the required Product Code. 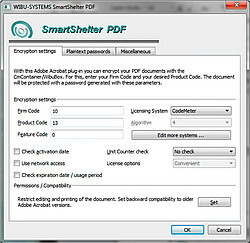 The SmartShelter PDF plugin encrypts the document and generates an extremely secure password which it safely stores in the dongle or soft license. The user never comes into contact with the password again. If the procedure described above is used extensively in an automated environment, SmartShelter PDF can be implemented as a command line tool. Document usage, such as printing or editing, can be controlled by granting or denying permissions. It is also possible to restrict use of the document to the Acrobat Reader only. Protection can be tightened even further, e.g. screen shot capturing can be disabled and a debugger check can be activated to close the document as soon as it detects a debugger running. The customer only needs to install a SmartShelter PDF plugin for the freely available Acrobat Reader®. If he owns a CmDongle or CmActLicense with the correct firm code and product code combination, he can now open the encrypted document. The CodeMeter technology used by SmartShelter PDF not only provides protection functionality for documents, but also allows flexible license models. The possibilities range from time-limited licenses through pay per use to network license models, and include any combination thereof. Hence new models for generating revenues from the sale or use of documents can be defined. The concept of arbitrary product codes permits a role-based permissions strategy for protecting documents. There are a number of ways to distribute licenses. If a permissions system has been implemented, CmDongles and CmActLicenses with the corresponding permissions levels (licenses) can be pre-manufactured and shipped to the user as and when required. On the other hand, online activation, as provided by CmLicenseCentral Internet, offers greater flexibility for both the publisher and the user. In this case licenses are not generated in advance, but are fetched online directly by the user from the publisher‘s server. This means a web shop, for example, can sell and distribute licenses worldwide, 24 hours a day, 7 days a week. To begin with, the publisher stores the licenses for sale as products in CmLicenseCentral. When a user purchases a particular product, the license publisher sends him a ticket by email. The ticket can be redeemed for the licenses at the publisher‘s web portal. The licenses are then transferred to the CmDongle or activated in the CmActLicense immediately. CmLicenseCentral Internet can also be integrated into the publisher‘s existing processes. This can be accomplished using web interfaces. 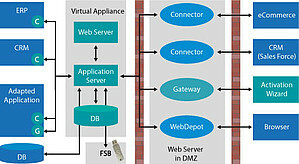 In this case, connection is possible to existing internal or external ERP or CRM systems which directly accept customer orders and generate the corresponding tickets. An alternative is the direct integration into a publisher‘s shop system. If you desire a system which simultaneously protects your documents and implements appropriate license models for your users, then SmartShelter PDF is the ideal solution. Not only does it protect documents, it also allows you to generate and distribute licenses for the documents. So SmartShelter PDF is on the one hand the right choice for editors, who want to get paid for each copy and on the other hand for companies that want to distribute chargeable content or want to protect their manuals, patents and legal documents. In doing so it optimally fulfills the requirements of small business solutions as well as those of complex document management systems.